Asian Pennywort We call in Assamese Manimuni. 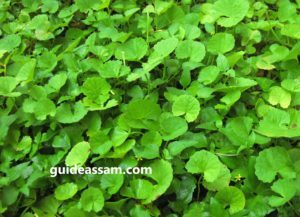 Asian pennywort or Manimuni is tender herb which is easily avaialble in everywhere in Assam. Asian pennywort widely used in cuisines pf South East Asia and North East India. Asian pennywort is known for its properties heal stomach alimony Nausea drowsiness and internal wounds. Asian pennywort (Manimuni) Can eaten as Salad, Chutney and fry cooked people also like to eaten as presser cooked like curry. Manimuni aru aalu voja ( Asian Pennywort with Potato fry ). Manimuni aaru Bilai jhool ( Asian Pennywort with Tomato Curry ). Manimuni khukan voja ( Asian Pennywort Dry fry ). Manimuni logot mash jhool ( Asian Pennywort with Fish Curry ). Manimuni aaru aalu pitika ( Asian Pennywort with Potato Chutney ). and many others. Asian pennywort (Manimuni) we belive in Assam it's very healthy. Manimuni is also a green Vegetable. You can also check - Baahor chungar Maach.